maize flour recipes | makai ka atta Indian recipes. Maize flour also called as corn meal and Makai ka atta. It is yellow coloured flour with coarse texture. Corn meal is made by grinding corn kernels into a coarse powder. Unlike cornstarch, processing cornmeal doesn’t involve the separation of bran, germ and endosperm, so you are able to retain more of the nutrients in the corn than with, say, cornstarch. Makai ka atta is used extensively in Indian cooking. Enjoy the healthy Punjabi makai methi roti with a bowl of curds. The Makai Mooli and Methi Paratha is a popular breakfast recipe in the Punjab region. Unleavened rotis of wheat and maize flour (makkai ka atta), Tikkar is a mouth-watering delicacy from the dessert province of Rajasthan. Cooked with ghee, this crisp bread is wonderfully flavoured with ginger, garlic, onions, and more, which makes it enough to serve it with a simple accompaniment of curds and pickle. Just make sure you serve it immediately before it hardens. Chatpata Rings is a crispy ring-shaped jar snack made with maize flour flavoured appetizingly with chaat masala and other spice powders. Kids (and adults too!) will love the peppy flavour and crisp texture of this snack. You can make a batch of this and store it in an airtight container for more than a week. Gujaratis enjoy their khatta dhokla and khaman dhokla. We present a makai na dhokla recipe option using maize flour. Or make the Gujarati evening snack of methi makai dhebra. Corn sev puri is a popular gluten free option to the regular sev puri recipe. The puris are made from maize flour. If you wanna dabble with Mexican cooking, this is one of the first recipes to learn. Authentic, maize-flour based tortillas are key to the success of Mexican wraps and rolls. Maize flour gives the tortillas a classic texture, while carom seeds and spice powders give it a fascinating flavour. Kids love Nacho Chips which have a characteristic texture that is quite different from other chips, perhaps due to the combination of maize flour and plain flour. Baked tortilla chips, a quick, easy-to-make, healthy starter which is a popular choice in Mexico. The tortillas are baked and made with minimal oil from a blend of more whole wheat flour than maize flour instead of the traditional Mexican tortillas made with maize flour and refined flour which are also deep fried. Maize flour : Maize flour is a carbohydrate rich and energy rich flour loaded with fibre. Cornmeal prevents your blood sugar from shooting up and loaded with Zinc which is necessary for the formation of insulin. Maize flour is a good source of magnesium which is necessary for maintaining a steady heartbeat and normal blood pressure. The fibre binds with the bile salts and throws it out of the body, which helps in reducing the cholesterol from the body and good for heart. Find out is maize flour is healthy and how to make it part of your diet. 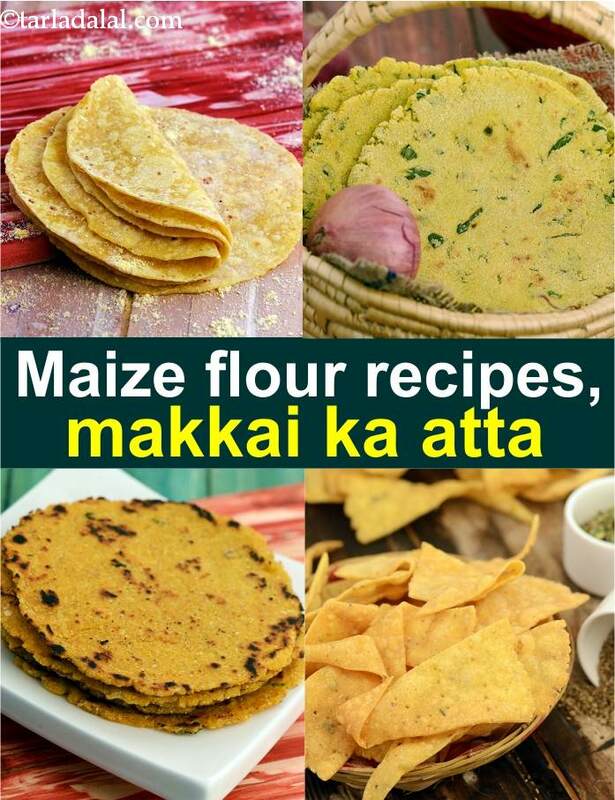 Enjoy our maize flour recipes | makai ka atta Indian recipes given below. A mexican snack, popular with youngsters.